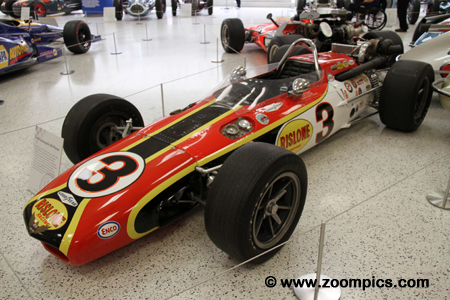 The Indianapolis Motor Speedway Museum was established in 1956 to display race cars and historical artifacts associated with the Indianapolis 500. The first Museum was located on the southwest corner of the property. In 1975, track owner Tony Hulman built a larger facility located inside the race track. The Speedway grounds were designated a National Historic Landmark in 1987. The approximately 30,000 square foot museum attracts an estimated 130,000 visitors on an annual basis. In celebration of the 40th anniversary of A.J. 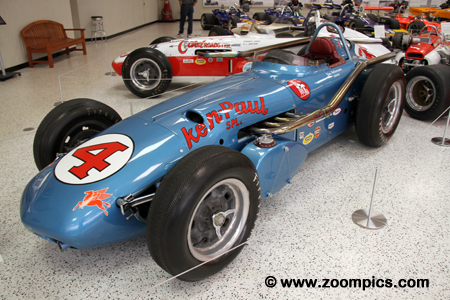 Foyt’s fourth Indianapolis 500 win, the museum presented nearly three dozen cars that he drove during his racing career. The first Indianapolis 500, in 1911, attracted forty-six entries all vying for the $27,550 purse. 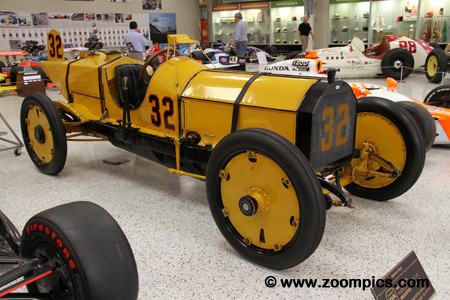 Ray Harroun was a Marmon engineer and came out of retirement to compete in the 500 with the Marmon Wasp. He qualified the six-cylinder Wasp twenty-eighth and was the first driver across the finish line after 500-miles. Unlike the other entries, Harroun did not use a riding mechanic but relied on a rear view mirror. 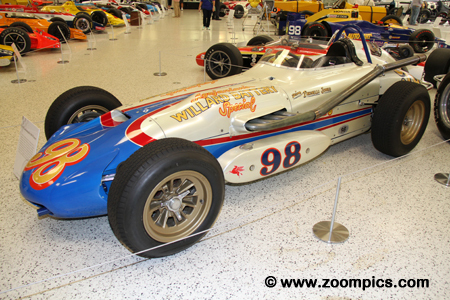 Parnelli Jones won the 1963 Indianapolis 500 driving the No. 98 Offy-powered Watson roadster. This car was called the ‘Agaganian Willard Battery Special,’ but it was nicknamed, ‘Calhoun’. The roadster debuted in 1960 and was driven by Lloyd Ruby who finished seventh – the next four-years it was raced by Jones. Jones was almost black-flagged during the 1963 contest when the car developed an oil leak late in the race. The No. 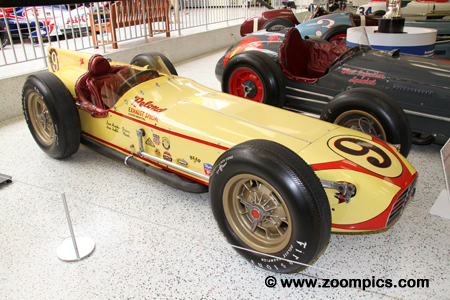 9 Epperly / Offenhauser won the 1957 and 1958 Indianapolis 500. The car was built by George Salih, an employee at Meyer and Drake, the manufacturers of the Offy engine. He constructed the car at his house in California. Salih’s idea was to mount the motor on its side which lowered the center of gravity. His concept worked as Sam Hanks won in ‘57 and Jimmy Bryan was successful the following year. After several years of competing in Europe, American Alexander Rossi returned to the US and raced in the 2016 IndyCar Championship. 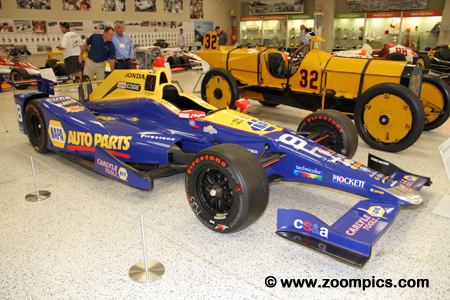 Rossi joined the Andretti Autosport team and delivered some respectable results early in the season. The highlight of his year would come at the Indianapolis 500. Rossi managed his fuel mileage while the other leaders pitted fuel and succeeded in winning the 100th Indianapolis 500. 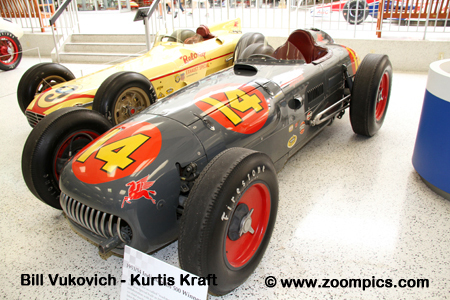 The 1960 Indianapolis 500 was the 44th running of the event. The race saw a then-record twenty-nine lead changes between the 1959 race winner, Rodger Ward and Jim Rathmann. Prior to the 1960 event, Rathmann had three runner-up finishes (1952, 1957 and 1959). In this year’s contest, Ward suffered tire issues with three laps to go - Rathmann took the lead and win, driving the No. 4 Watson powered-Offenhauser. A.J. 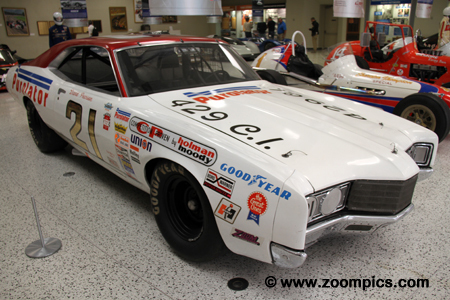 Foyt drove this Wood Brothers’ prepared Mercury Cyclone to victory in the 1972 Daytona 500. In qualifying, Foyt put the 429-cu.in. V8-powered Cyclone on the outside of the front row. There were only thirteen lead changes between three drivers – Foyt, Richard Petty and Bobby Allison – during the five-hundred-miles. He would dominate the final stage of the event – winning by over one-lap. During practice for the 1969 Indianapolis 500, Mario Andretti suffered burns to his face when he crashed in turn-four. Andretti had to qualify a backup car and put the STP sponsored Hawk powered-Ford in the middle of the second row. He inherited the lead when Lloyd Ruby had a pit-lane incident. Despite a slipping clutch and an overheating engine, Andretti held on for his first and only Indianapolis 500 victory. 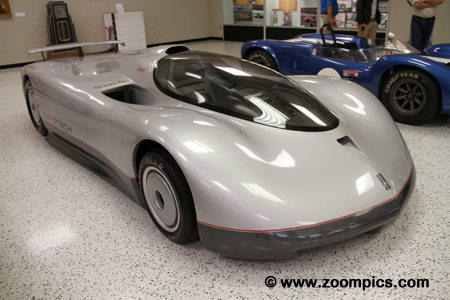 A March Indy Car chassis was used for the Oldsmobile Aerotech I. The March was fitted with an aerodynamic carbon fiber body. The Aerotech is powered by a turbocharged version of the 2-liter Oldsmobile Quad 4 engine. A.J. Foyt drove the car to a new world closed-course speed record of 257.123-mph on August 26, 1987, at a 7.712-mile test track in Texas. Qualifying for the 1968 Indianapolis 500 was dominated by Andy Granatelli’s turbine-powered Lotus 56 – drivers, Joe Leonard and Graham Hill qualified first and second. Gridded third for the start was Bobby Unser racing for the Leader Card Team in a 68 Eagle / Offenhauser. As predicted, the turbines dominated the race until all three broke or crashed. This left first place wide open and Unser scored the first of his four 500 victories. The 1977 Indianapolis 500 would be historically significant for a number of reasons. Two of which were, Tom Sneva, breaking the 200-mph barrier and Janet Guthrie becoming the first woman to qualify for the event. A.J. 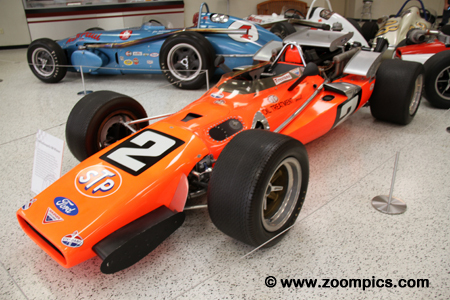 Foyt started fourth in this Coyote. During the race, he battled for the lead with Gordon Johncock until Johncock retired. 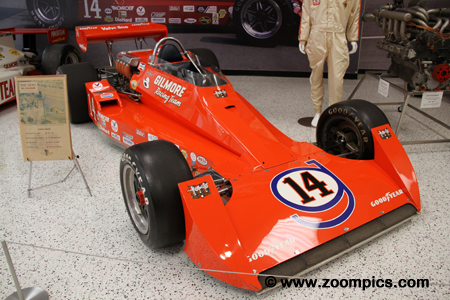 Foyt inherited first place and became the first driver to win the Indy 500 four-times. 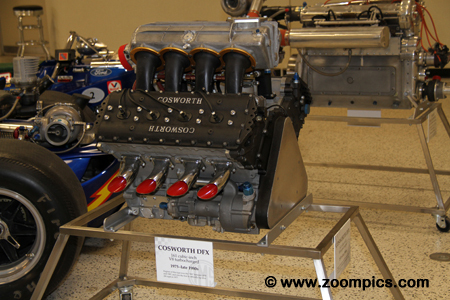 British engineering firm, Cosworth produced their first Cosworth DFV in 1966 for Team Lotus founder, Colin Chapman. The DFV became the engine choice for many Formula 1 constructors from 1968 to 1982 and powered twelve drivers to the world championship. In 1976, the Vels Parnelli Jones team developed the DFV for the USAC Indy series. Cosworth became involved and the engine was designated the DFX. The 80th Indianapolis 500 was the first contest organized by the Indy Racing League (IRL) and was boycotted by many CART teams. While the IRL teams competed at Indianapolis and an alternative event was held by CART called the U.S. 500. Despite the split, there was a full field of thirty-three starters. 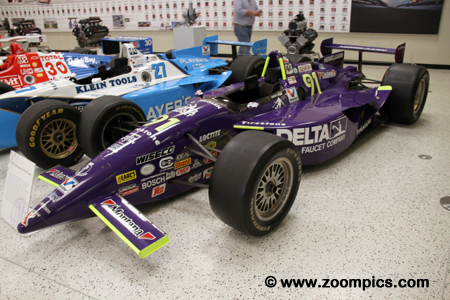 The race was won by Buddy Lazier driving the No. 91 Hemelgarn Racing Reynard 95I powered by a Ford XB.